Zoe Cuthbert gets the star treatment for warm up. 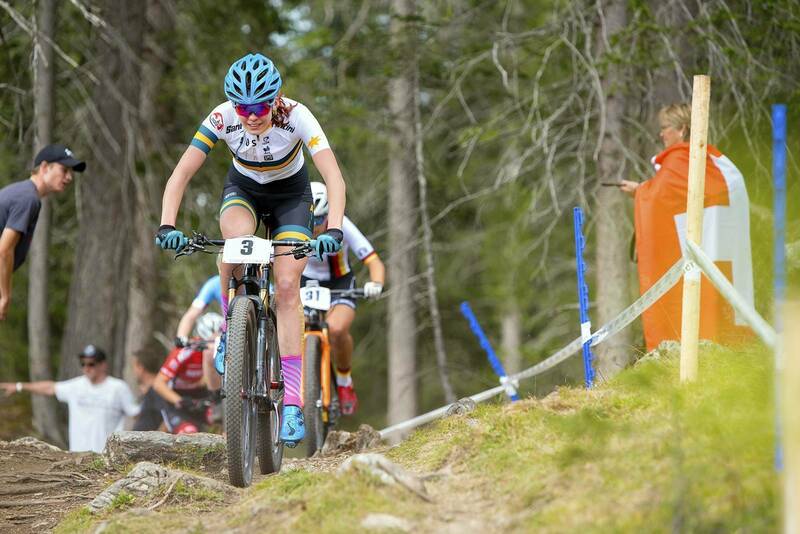 Laura Stigger comfortable in front. And the carnage to follow. Would a flat rob Swiss Rouiller of a medal? Sam Walsh had a grin on his face almost all race! 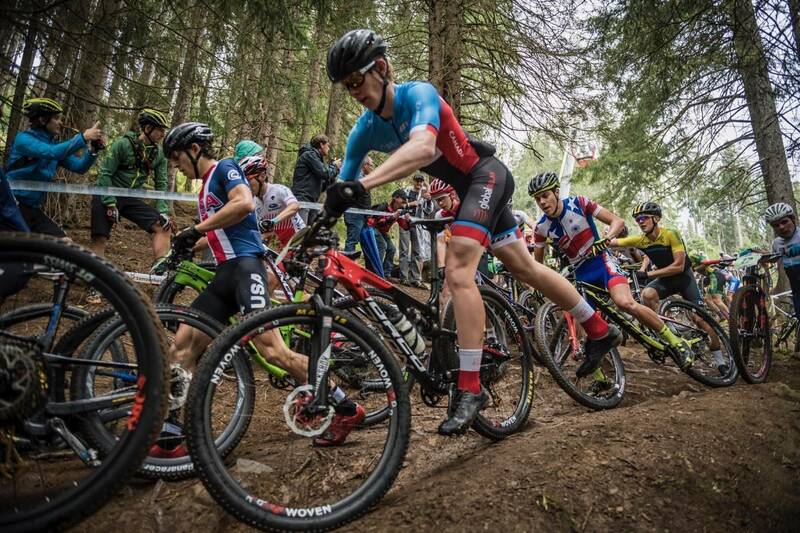 The Junior category for XCO and Downhill show where the next generation of stars will come from. 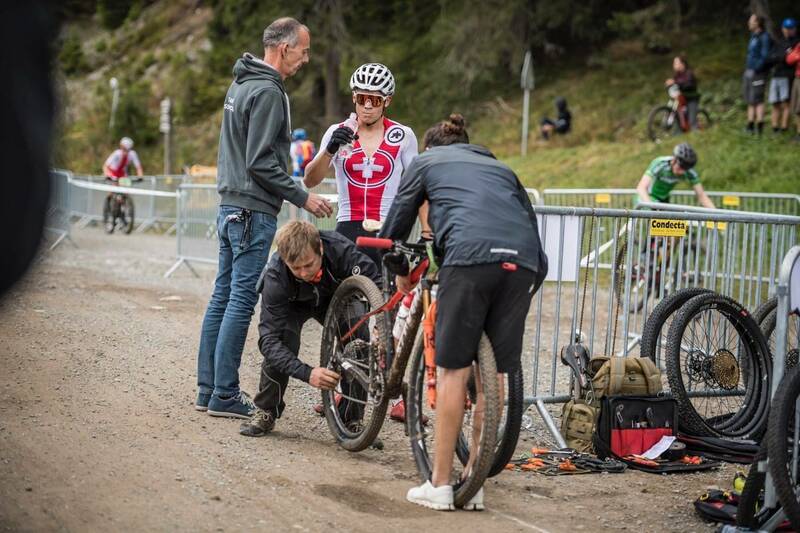 And today we got a real insight to the future of XCO MTB. 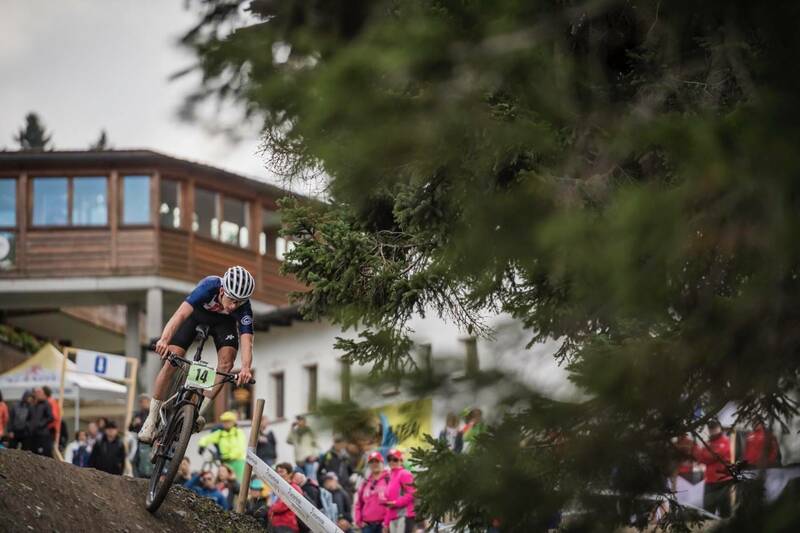 The UCI Mountain Bike World Championships continued in Lenzerheide today - first up with course practice for downhill - the first time riders have been able to put rubber on dirt. 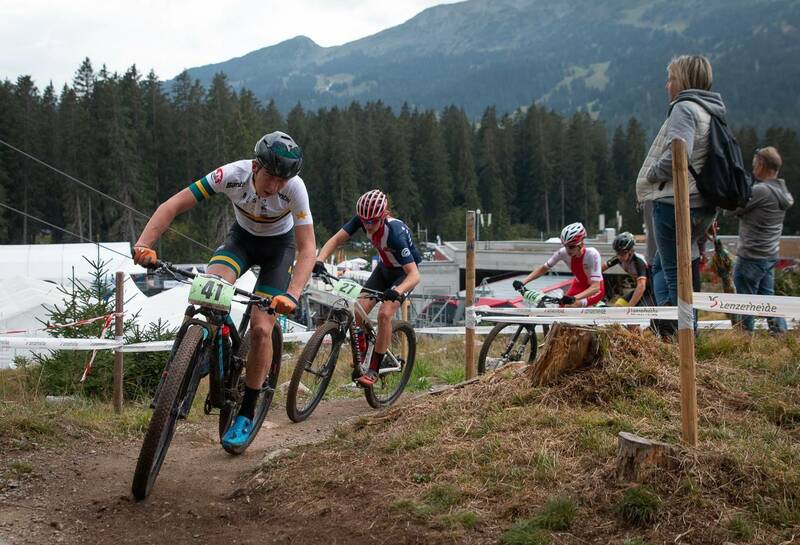 But this afternoon was all about XCO, as Junior men and women took to the demanding XCO course here in Lenzerheide Bike Park, and crowds amassed to watch the action unfold as some of the fastest 17 and 18 year olds in the World came to race bar to bar. 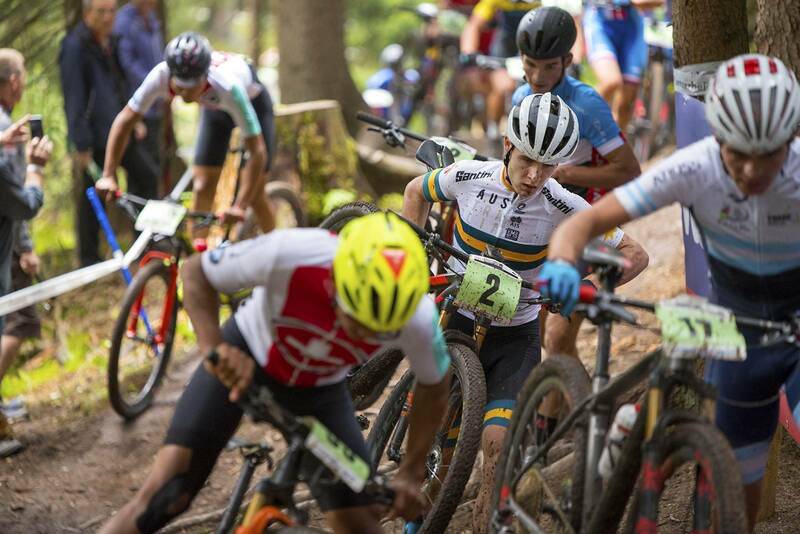 Last year, diminutive Austrian Laura Stigger wowed the scene with her commanding ride in the Junior women's XCO race in Cairns. And as the gun went launching about 60 women into the start loop, it looked like the exact same thing would happen. 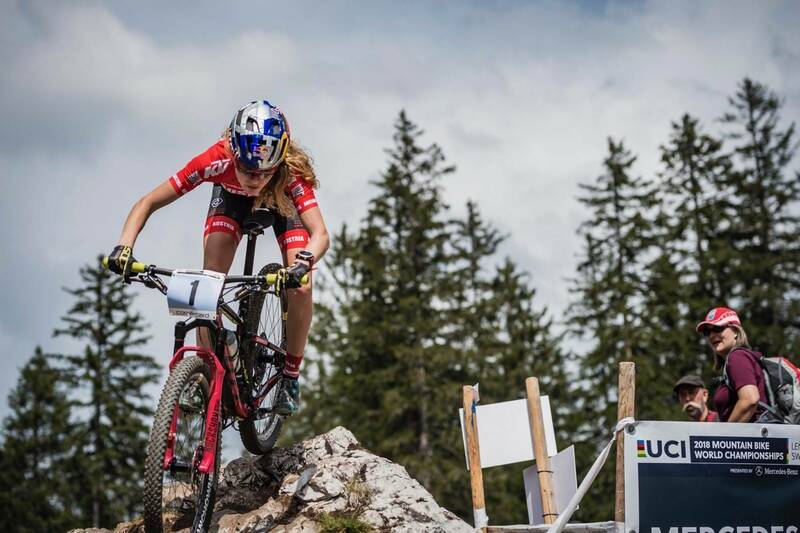 While Sitgger went about building a sizeable lead, the battle remained close behind, with Saskova, Harnden, Medde and Pederson duking it out. 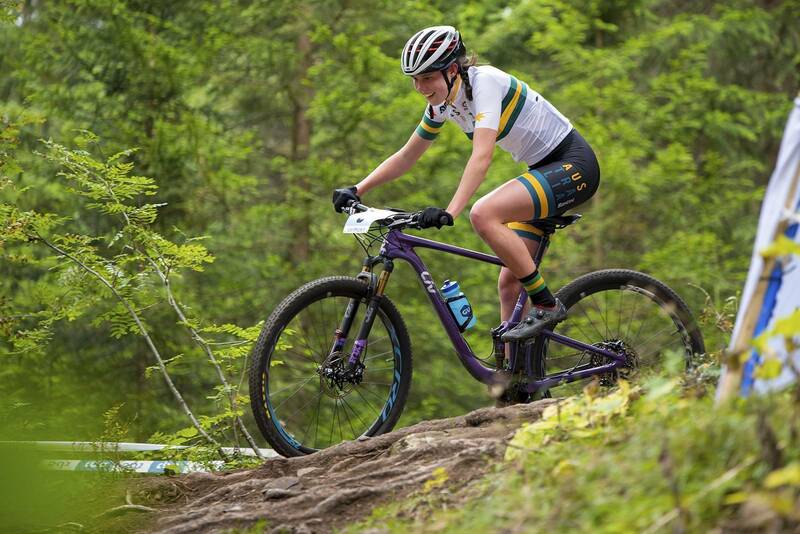 Australians Zoe Cuthbert and Teagan Atherstone rode atrongly from their start positions - Atherstone even making it into the singletrack right near the front! 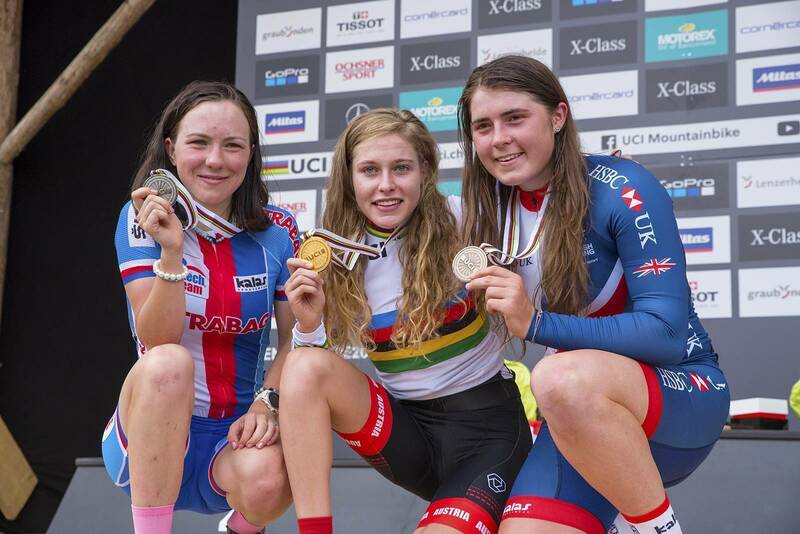 "It was amazing out there - I was standing on the start line and they just kept on calling names up!" Atherstone said post-race. 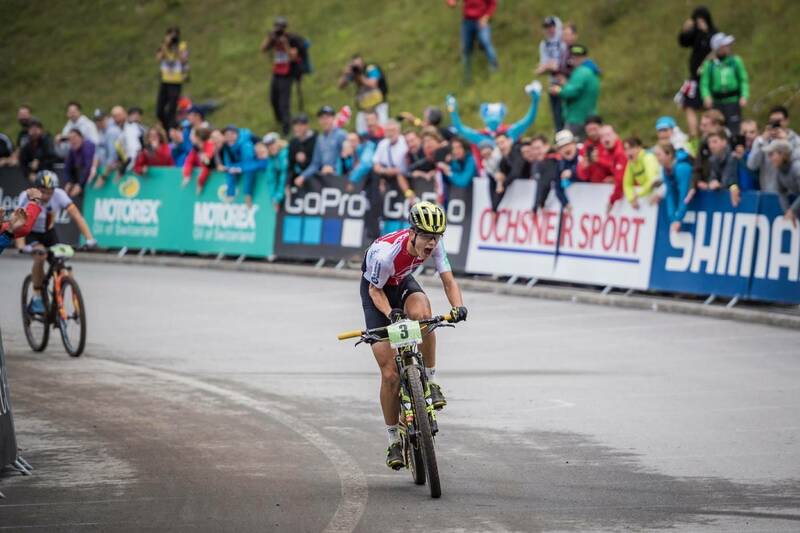 "I was pretty happy with my start, I was blown away actually. 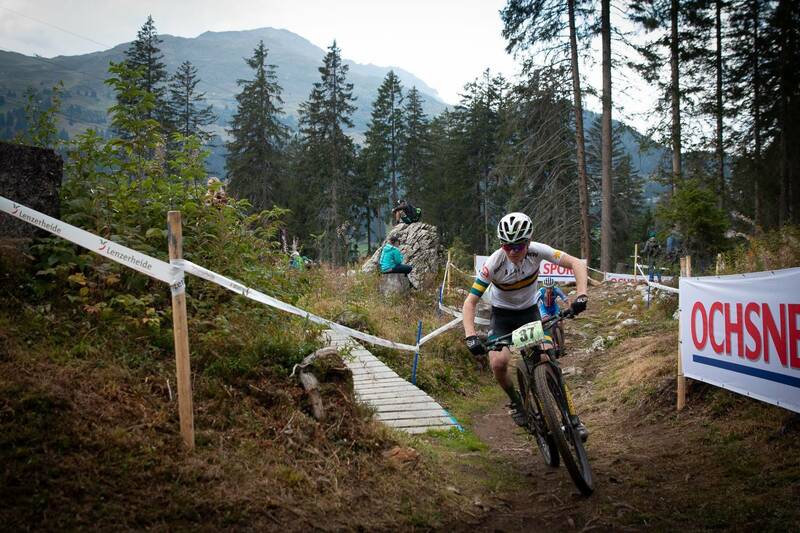 I think I was 2nd into the singletrack. 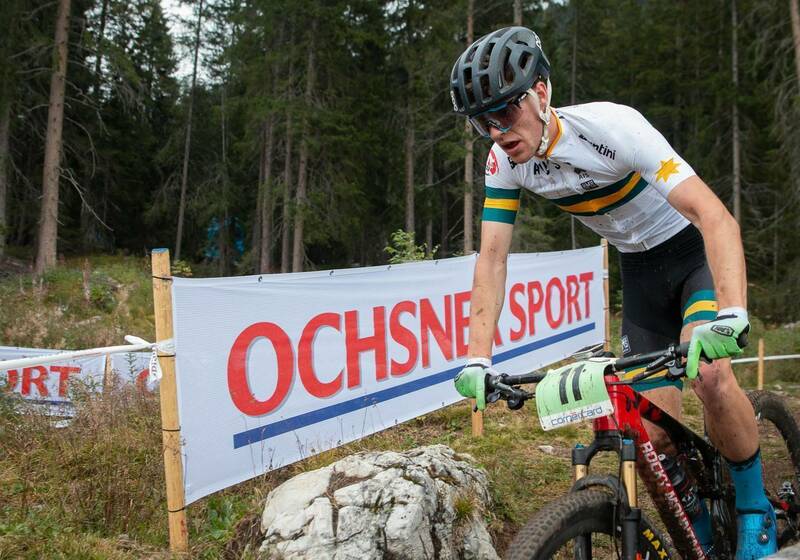 I was stoked with that, I couldn't have asked for more." In a field of about 60 women, Atherstone also had the opportunity to race in one of the biggest women's fields available for U19s. "It was so motivating. I've come here and it's just totally different. At home the only person I have to chase is Zoe. 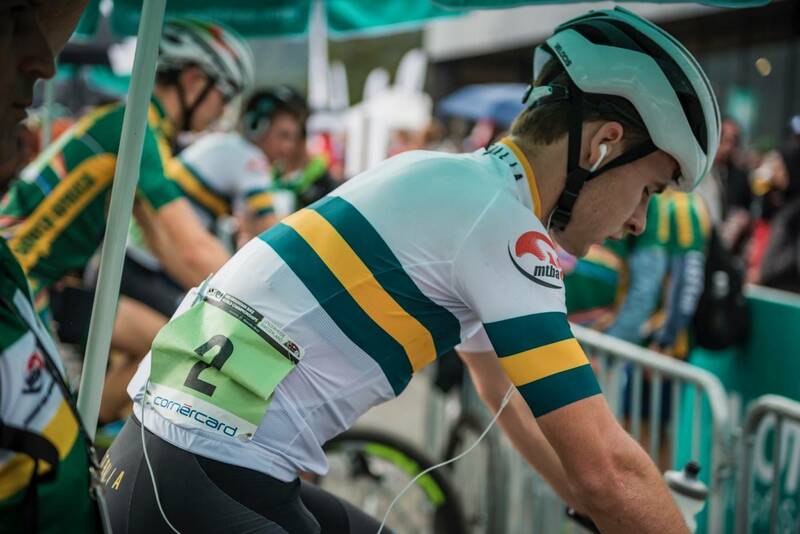 I can't wait to race against a big international field again, as you have so many people to compare yourself too." It really didn't matter where the racers were in the field, as the cheers were loud for anyone really having a dig and pushing themselves. 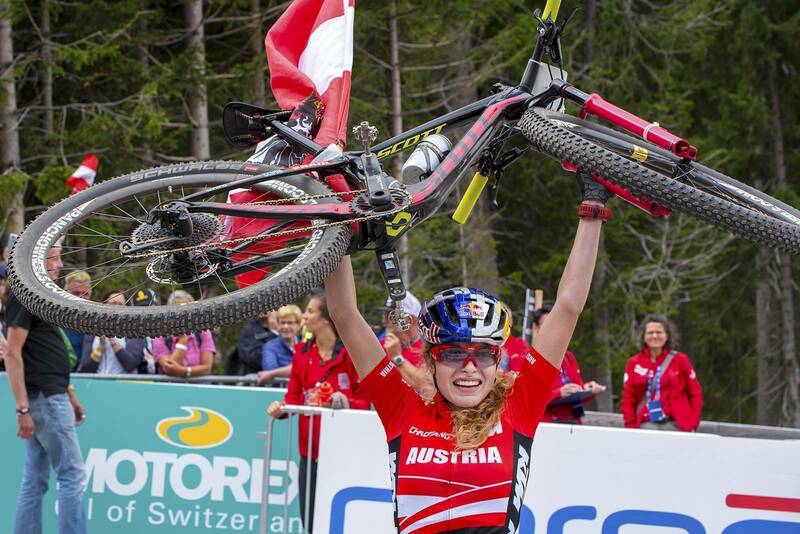 It was Stigger who crossed the line first, popping out up the finish straight already holding an Austrian flag aloft that would have swept her away in a strong gust. 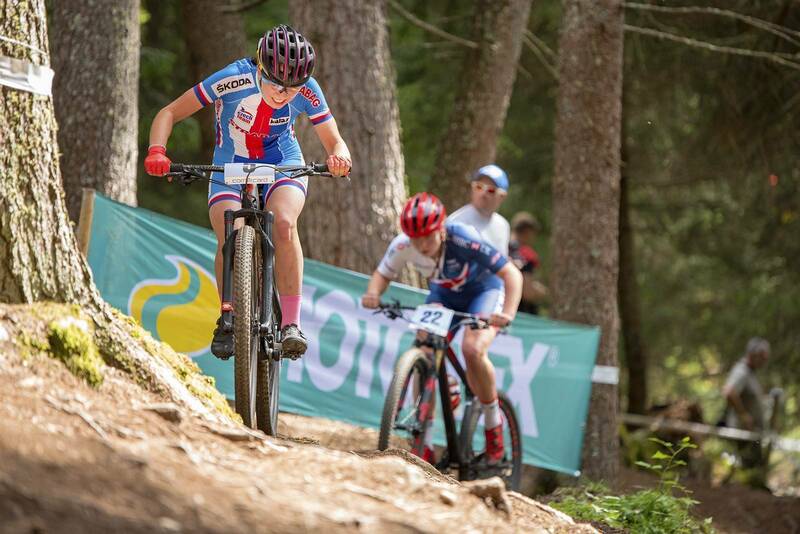 It was over three and a half minutes until second placed Teresa Saskova of the Czech Republic crossed the line, just ahead of Harriet Harnden in third. 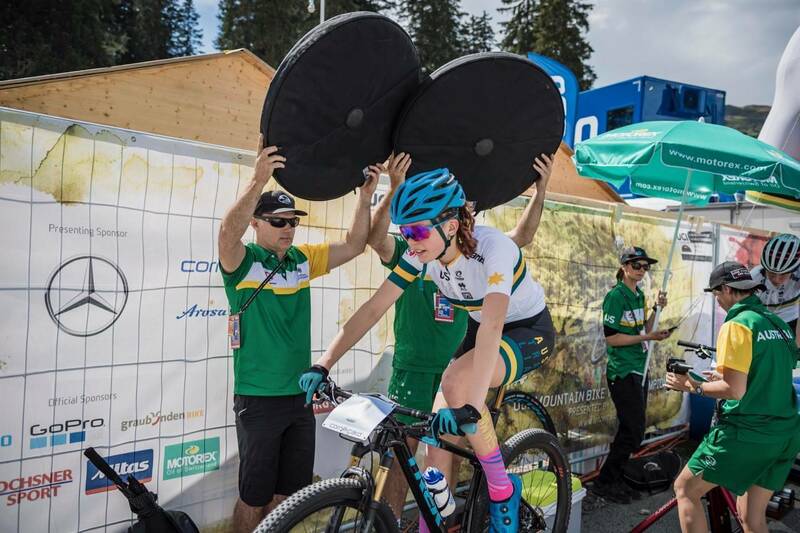 Zoe Cuthbert and Teagan Atherstone finished 20th and 47th respectively. Just as the Junior Women finished, the buidling clouds started to shed their load. The rain was light, but it wouldn't take much water to take some moisture onto the roots. Would this change the face of the race? 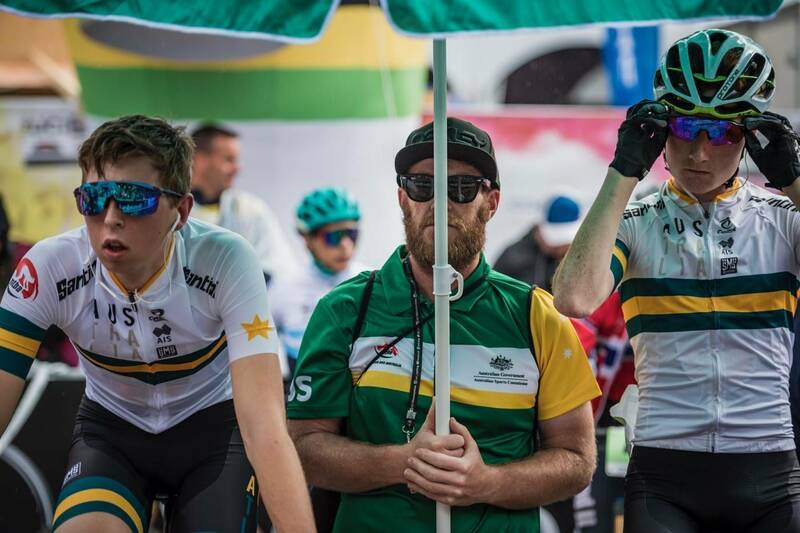 The trainers hummed in the staging area, the Junior Men setting their rollers to a high pitched hum as they poured testosterone through the pedals. The call up saw the riders roll through the tunnel - a ceremonial entry into the battle that lay ahead. The start was intense! With Cam Wright with plate 1 and Matt Dinham with plate 2 - Australia was well placed. Especially with Sam Fox, Sam Walsh and Corey Smith rounding out the team. Wright exploded off the line as the gun went! The front of the race was fast and tight - and it was Mathis Azzaro of France who was keen to put his name at the top of the leader board, with a blistering pace. 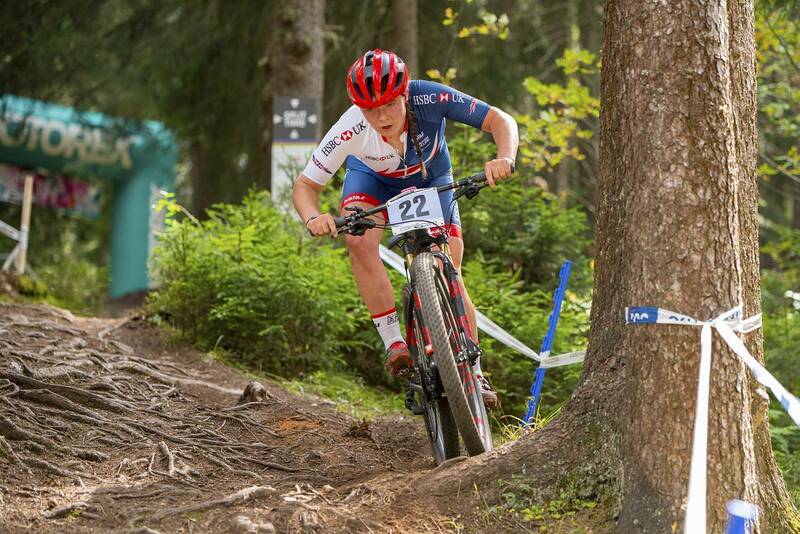 Matt Dinham was clearly feeling excelleing, attacking and moving to the front before coming unstuck on some of the infamous roots of Lenzerheide. 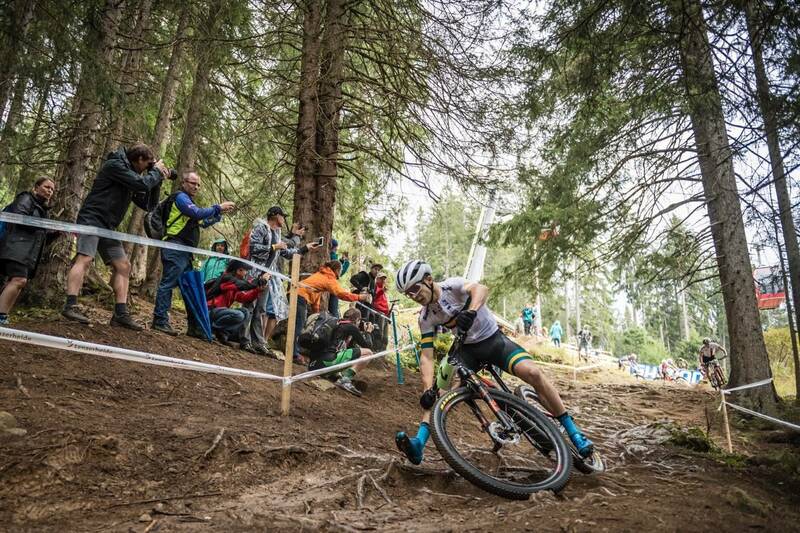 While the gaps were relatively small they were hard fought and there was little free air between riders. Azzaro built a lead but was then caught and the leading trio of Azzaro, Balmer and Kaiser (German, if you didn't guess) went into the final lap playing a game of cat and mouse. 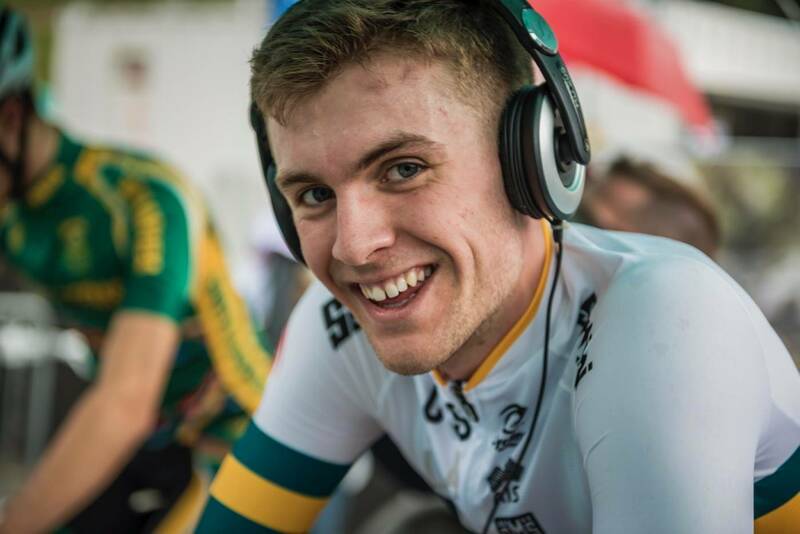 Wright was sitting in 5th, a little over a minute back, but without much space behind he was under pressure from other riders all keen to prove their mettle on the world stage. 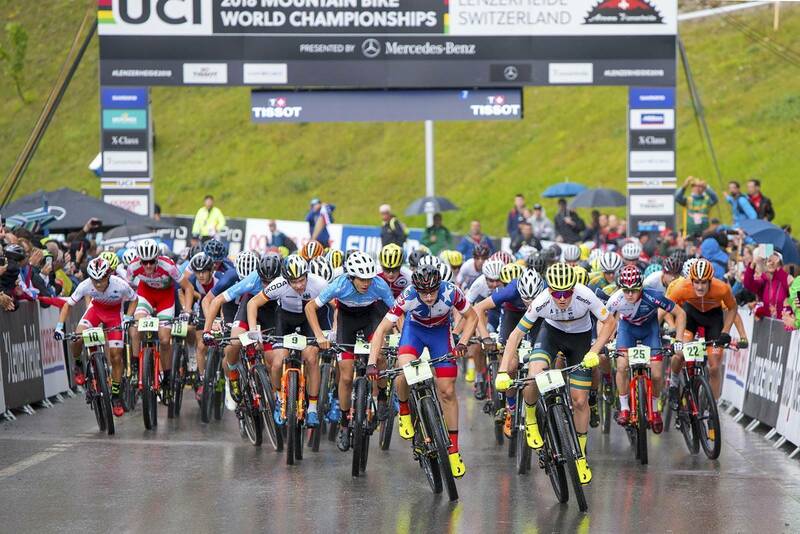 In the closing lap the late charge from German Moritz Schäb would see Wright slip back to 6th - a highly commendable result in such a crazy race and strong field. 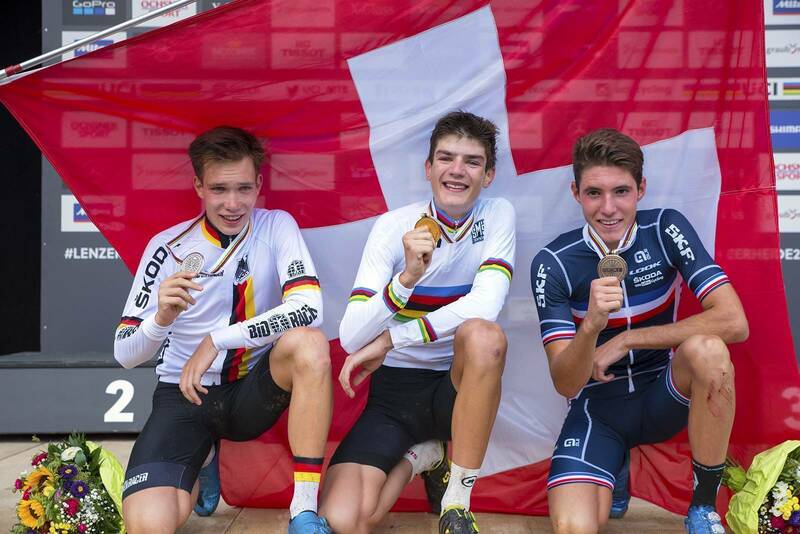 While Balmer proved victorious ahead of Kaiser and Azzaro, Loris Roullier of Switzerland was 4th, ahead of Schäb and Wright. 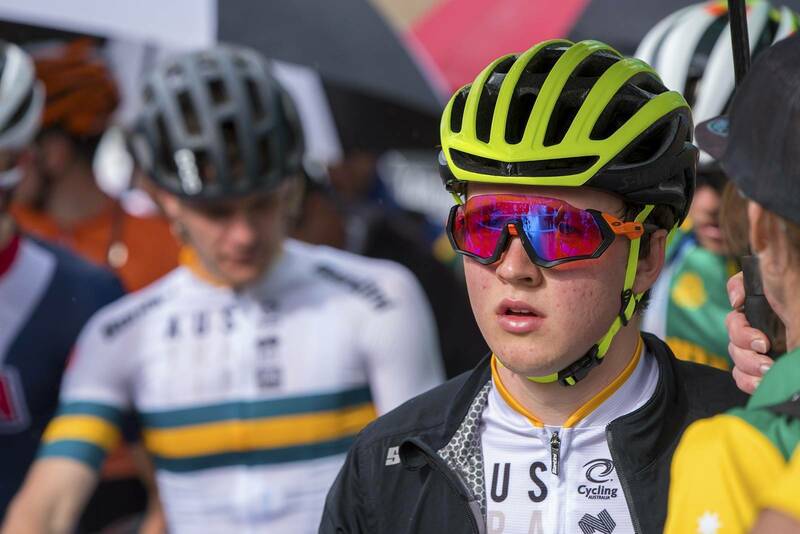 "The first minute up that climb at the start was full on," said Wright after the race. "It was Matt Dinham, myself and a German bloke sitting on the front. 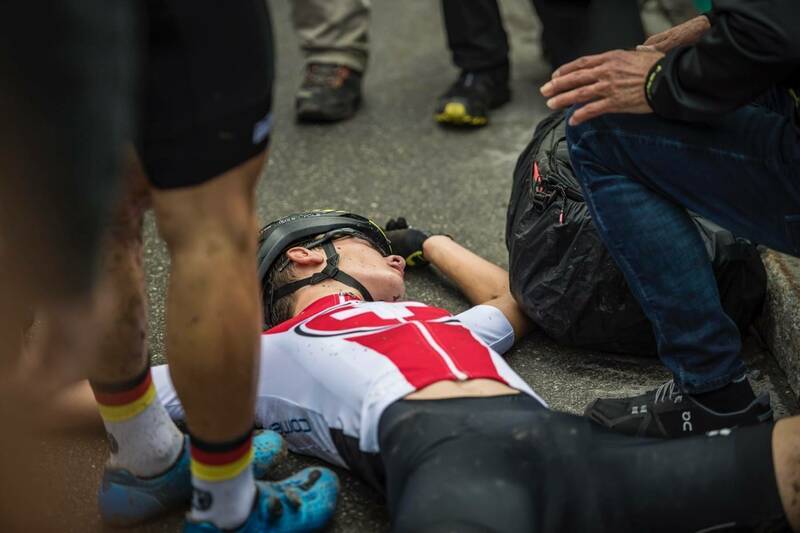 Matt was obviously feeling good and launched an attack, got in the front but I don't know what happened down the chute." This is where Dinham crashed on the roots, a prediction of the first lap carnage that would be right behind him. "I went down there in about 10th, and was then just picking away at people from then on. The concrete climb was a killer. At one stage I had a reasonable gap, but the Italian and German got past me on the concrete climb. I managed to catch the Italian back up but not the German. It was a good race and I'm looking forward to next year already." The skies are now clear over Lenzerheide - but the horizon is loaded with cloud. While we can all check various weather forecasts it is the mountains that will decide what the weather is for the next races. Full results can be found online.